To apply for admission into our apprenticeship program online, you must first complete the “Online Application”. Once your online application is submitted, a sample “Intent to Hire” letter, a list of signatory contractors, and a current job list will be sent to you. To apply for admission into our apprenticeship program in person, you must complete an application on any Monday through Friday between 9:00am and 3:00pm, and offices are closed for lunch between 12:00-12:45pm. In order to complete an application you must provide; valid photo id, copy of birth certificate, diploma or GED or 1500 documented work hours in the trade. Military applicants must bring a copy of their DD214. At this time you will receive in person a sample “Intent to Hire” letter, a list of signatory contractors, and a current job. Following the letter process, you will be asked to complete some paperwork and submit to a drug test, at your own cost. * After completing these two steps, a work permit card will be mailed to your home address and your apprenticeship will begin with orientation training. In the event the applicant passes the Substance Abuse Test, a work permit card will be mailed to the applicant’s home address. If the applicant fails to complete or pass the Substance Abuse Test, he/she will be denied acceptance into the Training Program and will not be eligible to reapply until at least 100 days have elapsed and then only with the approval of and subject to any conditions set by the Substance Abuse Subcommittee. In addition, both the company which signed the Intent to Hire letter and the Union will be notified of any positive result. Once admitted, the applicant will be notified by mail as to when to report for the first Week of orientation training. The applicant must attend one week (40 hours) of training class every three months for a total of 160 hours per year. The applicant must work a minimum of 650 hours every six months or 1,300 hours each year. Failure to attend the required training classes or to maintain sufficient work days will delay the six-month pay increases. 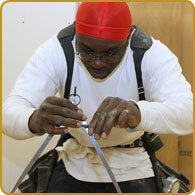 Jesse had a lifelong interest in the field of carpentry. His high school teachers recognized that the union apprenticeship program offered top training, pay and benefits and recommended the carpenters’ apprenticeship program to him and several of his fellow students. “By far, it was the best thing for me. The teachers were top notch, and covered everything from mathematical concepts to concrete forms. We then applied what we learned in the classroom in the shop.